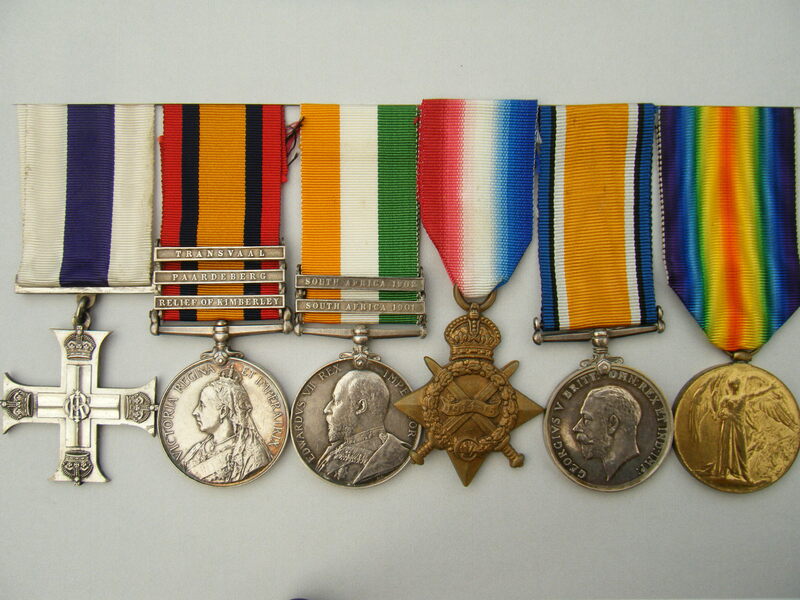 A Boer War/WW1 medal group spanning 20 years, including the Battles of Spion Kop, The Relief Of Kimberley, The Battle of the Somme, Vimy Ridge, Ypres and the 2nd Battle of Cambria to name but a few. The group is awarded to 5741, (later 5649 and then G/5194) Private, (later Company Sergeant Major and then 2nd Lieutenant) Sidney John Ashman, King’s Royal Rifles (later the East Kent Regiment and the Duke of Cambridge’s Own (Middlesex Regiment) who was killed in action on the 10th October 1918, the last day of the 2nd Battle Of Cambria. The Military Cross (in case) unnamed as issued. Queens South Africa Medal (with clasps TRANSVAAL, PAARDEBERG & RELIEF OF KIMBERLEY) named to 5649. CPL S. ASHMAN., EAST KENT REGT. The QSA Medal Roll confirming his clasps can be viewed by clicking on here (if you have access to Ancestry, although a paper copy will be supplied). Note the comment about ‘being brought in by Police’. 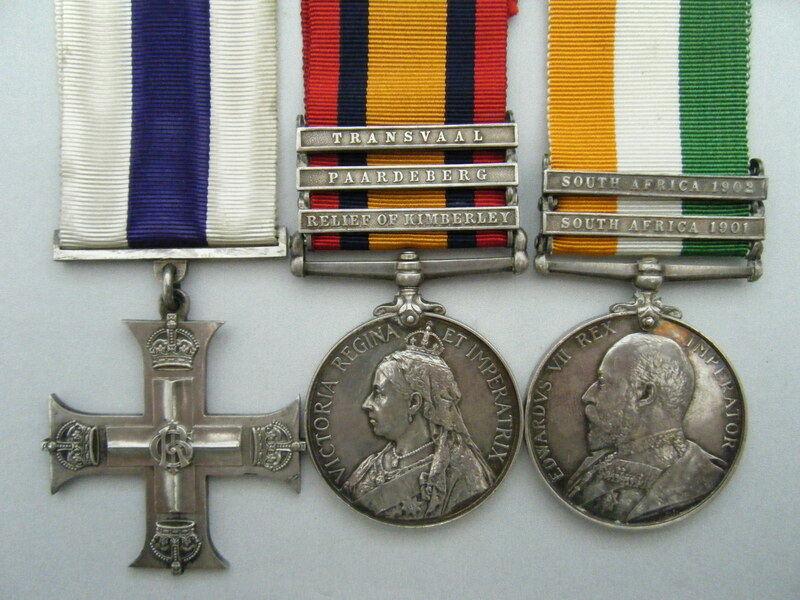 King’s South Africa Medal (with clasps SOUTHAFRICA 1901 & 1902) named to 5649. CORPL. S. ASHMAN., E KENT REGT. 1914-15 Star - This is a guaranteed original ‘blank’ 1914-15 Star, NOT an erased copy - the original is ‘lost’. 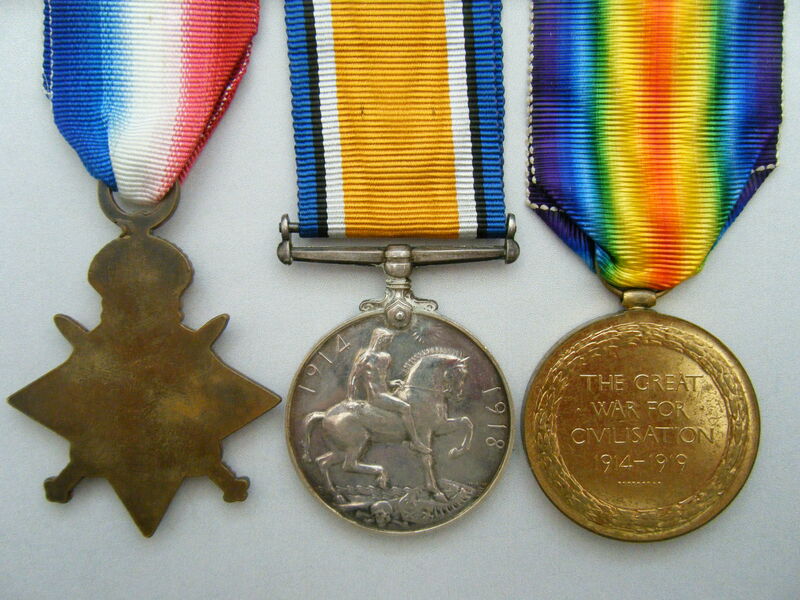 British War Medal and Victory Medal named to 2. LIEUT. S. J. ASHMAN. Unfortunately the Death Plaque (and scroll etc) are missing, along with his 1914-15 Star. 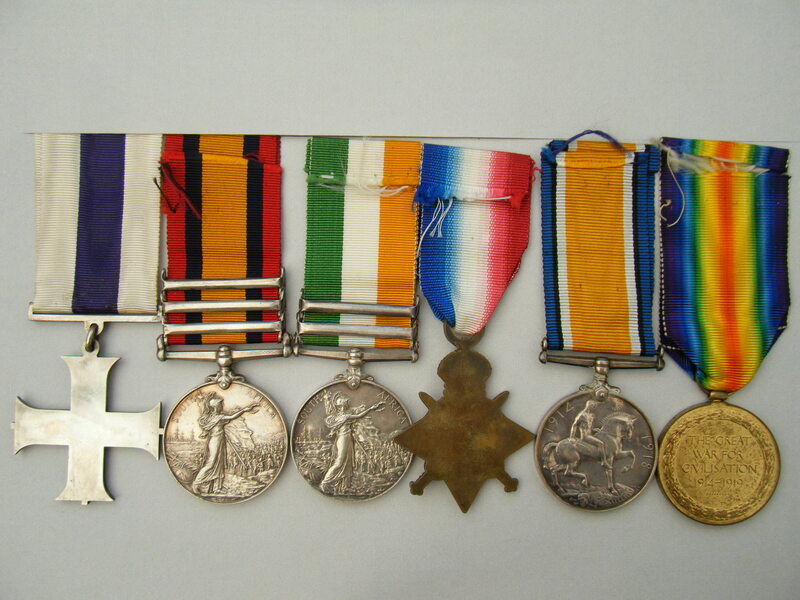 The medals are not mounted and have replaced ribbons, this listing also includes a paper copy of his Medal Index Card which can also be viewed by clicking on here (if you have access to Ancestry). Details of the 1914-15 Star would have been G/5194. SGT. S. J. ASHMAN. E KENT REG. His medal rolls details can be found by clicking on here (again if you have access to Ancestry). PLEASE LET ME KNOW IF YOU SEE THIS. Additionally, this listing comes with a paper copy of his WW1 OR and Officer Service Records - that contain a number of documents relating to this man including a letter from the next of kin enquiring after him. Ashman was born on the 25th January 1880 and lived in Paddington London. At the age of 17, having been previously employed as a kitchen porter at an address in Mayfair, he enlisted into the army in London on the 19th March 1898, and joined the 2nd Battalion Kings Royal Rifles (as No 5741 Private). 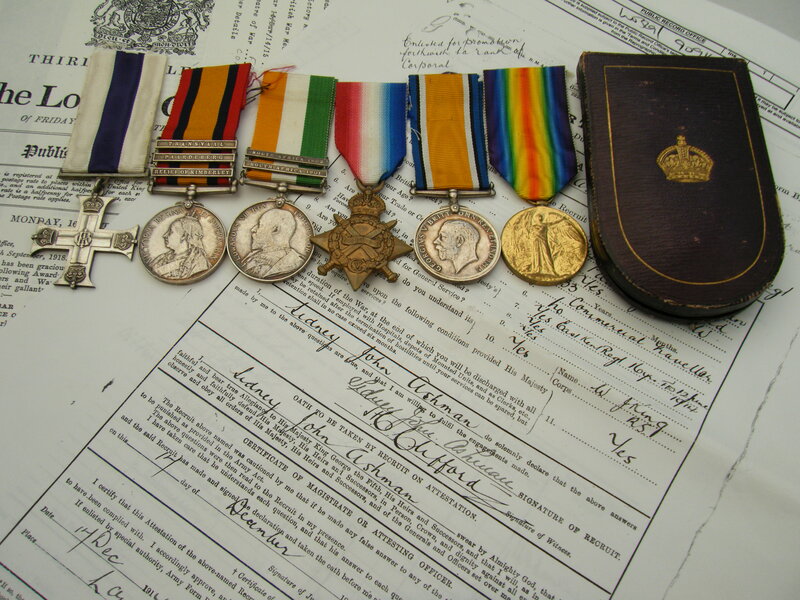 His service papers whilst serving with ‘The Rifles’, can be viewed by clicking on here if you have access to ‘find my past’ (although a paper copy will be provided upon request). It’s not clear whether he left the army, or, whether he transferred, but he appears to have ‘signed on’ again at Canterbury in June 1998, this time with the 2nd Battalion East Kent Regiment (now No 5649 Private). The unit was soon posted to South Africa and took part actions associated with the Boer War. In particularly, his unit participated in the Battle of Spion Kop, (details of which can be viewed by clicking on here) and the ‘relief of Kimberley’, (details of which can be viewed by clicking on here). The history of the 2nd Battalion ‘The Buffs’ themselves, can be viewed by clicking on here. Whilst in South Africa, Ashman was promoted to Corporal. His service paper whilst serving with ‘The Buffs’ can be viewed by clicking on here again if you have access to ‘find my past’, (although a paper copy will be provided upon request). Not-withstanding his military experiences, his career was not without incident, and he is listed in the ‘defaulter’s book’ twice, once for an event in Brighton in December 1899, and again in Dover January 1904. He was discharged to the reserves on the 7th January 1904, his discharge papers can be viewed by clicking on here but only if you have access to ‘find my past’ (although a paper copy can be provided upon request). Upon leaving the army, he took employment as a ‘commercial traveller’, giving his address as 64 Chippinham Road, Paddington West, but re-enlisted as a Private (No 5194) at London on the 17th December 1914 and was posted to the 9th Battalion East Kent Regiment (The Buffs) which was a reserve battalion at this point. His service records show that he was promoted to corporal in January 1915, and then to Sergeant in June 1915. In October he transferred to the 8th Battalion and was made ‘acting’ quartermaster in December 1915. Ashman’s Medal Index Card shows that he entered France on the 7th October 1915, so he would have gone into action with the 8th Battalion (now a part of the 17th Brigade a part of the 24th Division) at the battle of the Somme, details of which can be viewed by clicking on here. The unit history of the 24th Division can be viewed by clicking on here. This also provides an excellent order of battle, which includes the ‘The Buffs’. He was further promoted to Company Sergeant Major in August 1916, and was with the Division at the Battle of Vimy Ridge in April 1917, shortly afterwards, he earned a commission as an officer - this being documented as the 29th May 1917. Whilst undertaken Officer training he was appointed to the 5th (Reserve) Battalion The Duke of Cambridge’s Own (Middlesex Regiment) as a Temporary 2nd Lieutenant, and later (on the 10th August 1917) transferred to the 13th Battalion bringing with him 41 ‘other ranks’. His London Gazette entries confirming his commission can be viewed by clicking on here and his transfer back to active service can be viewed by clicking on here. At some point, between the 10th August 1917 and the 1st June 1918, Ashman was awarded the Military Cross - SEE NOTE1 - below. It was recorded in the London Gazette published on the 16th September 1918. His citation for this action can also be found in London Gazette and can be viewed by clicking on here. In 1917, the 13th Battalion was located in France and took part in the following actions: The First Battle of the Scarpe, The Second Battle of the Scarpe, The actions on the Hindenburg Line, Operations on the Flanders coast (Operation Hush), The Battle of the Menin Road Ridge and The Battle of Polygon Wood. During 1918, they took part in the following actions: The Battle of Messines, The Battle of Hazebrouck, The Battle of Bailleul, The defence of Neuve Eglise, The First Battle for Kemmel Ridge, The fighting for and recapture of Ridge Wood, The Battle of the Epehy, The Battle of the St Quentin Canal, The Battle of the Beaurevoir Line, The Battle of Cambrai, The pursuit to the Selle and The Battle of the Selle. The battalion ended the war in France, Berlaimont - west of Aulnoye and a very detailed account of their actions can be viewed by clicking on here and their war diaries can be also be viewed by clicking on here. In regards to the war diaries, Ashman is mentioned by name on the following dates: 10th August 1917, 3rd September 1917, 16th September 1917, 3rd October 1917, 16th October 1917, 12th May 1918, 21st & 22nd May 1918, 1st June 1918 (presented with M.C. ), 12th July 1918, 3rd September 1918 where he goes on leave and is killed in action on his return to the unit the following month on the 10th October on the last day of the 2nd Battle Of Cambria. The war diary records that day that: ‘…Heavy shelling and machine gun fire was met with, the total casualties being 6 Officers and 108 men killed, wounded and missing.’ (2 Officers are later confirmed as KIA). His entry in the Commonwealth Wealth War Graves Index can be found by clicking on here. Given the description citation of Ashman’s M.C.its very possible that this is the action in which he won it. PRICE £2500 - please read the terms and conditions below.